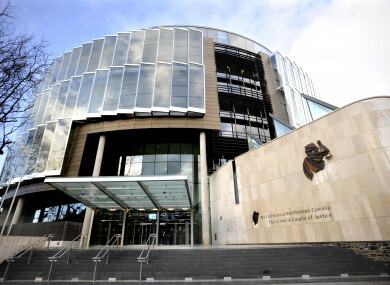 Hutch pleaded guilty to burglary and assault causing harm to Karl Higgins at the Office of the Revenue Commissioners, Hammam buildings, Upper O’Connell Street on 7 March 2018. Judge Melanie Greally noted the burglary had developed into a violent struggle when Hutch was interrupted and his escape prevented. Higgins suffered a number of blows during two scuffles. Two of Higgins’ colleagues came to his assistance and subdued Hutch until gardaí arrived. Judge Greally noted Hutch has been in custody since the date of his arrest and is very isolated in prison, where he has become “paranoid” in relation to others including prison staff. She said he is “extremely fearful for his own safety and has substantial cause for that fear”. During the sentence hearing, Cooney said Hutch was on protection in custody in a single cell and had formed certain views that the prison authorities were contaminating his food and water. He said that despite this Hutch described missing his father and wishing he was around to “steady the ship” and get him back on the right path. Cooney said his client began using cannabis at a young age, later progressing to heroin. He also became involved with criminality from a young age. Garda Gavin Feeley told Aoife McGillicuddy BL, prosecuting, that at about mid day on 7 March 2018 Hutch got into the Eir building through an unlocked door as maintenance was taking place. He walked around the building for a time before going through another door into the adjacent Offices of the Revenue Commissioners. He walked upstairs and into the unoccupied office of Karl Higgins, who was on his tea break. When Higgins returned to his office he found Hutch in his office holding a white box containing his mobile phone and accessories. He shouted at Hutch, who put the box in his pocket and tried to leave the office. Hutch ran at Higgins who was in the doorway and a scuffle began in which they both fell to the ground. Hutch punched Higgins in the face as they fell. Hutch got up and ran away. Higgins raised the alarm and followed Hutch who was attempting to open an inner door that was kept permanently closed. Hutch turned and ran back towards Higgins, who shouted at him to drop the phone. Hutch punched him in the face on at least two occasions in the course of another scuffle, during which Hutch grabbed a steel pole and pushed it onto “the neck or chest area” of Higgins. Two of Higgins’ colleagues came to his assistance and they managed to subdue Hutch on the ground until security arrived. The phone in the white box was recovered as well as a second phone and a camera. Garda Feely was on duty nearby and was alerted by a staff member. The court heard Higgins suffered bruising and tenderness to his cheekbone. There was no victim impact report. Email “Hutch family member jailed for breaking into Revenue offices and assaulting man”. Feedback on “Hutch family member jailed for breaking into Revenue offices and assaulting man”.